Inspiring the next generation of leaders: Supporting women and girls, especially in male-dominated industries such as technology, is critical. This March, Apple is highlighting the stories and work of female developers, musicians, artists, photographers and entrepreneurs. As part of its community education initiative, Apple is partnering with Girls Who Code to help 90,000 girls nationwide learn Swift, Apple’s programming language. Additionally, the App Store will engage consumers all month long by featuring apps founded, developed or led by a woman, including Bumble, TheSkimm and Stitch Fix. Finding power in partnerships: Major consumer brands, including The Estée Lauder Companies, Inc., Nordstrom, UGG and Williams-Sonoma, Inc., are realizing the power of partnerships by coming together to raise the profile of women leaders across global supply chains through the “This Is A Leader” campaign. The program is coordinated by Business for Social Responsibility’s (BSR) HERproject, a collaborative initiative that strives to empower low-income women working in global supply chains. Company leaders came together yesterday in New York for an event to discuss their visions for women’s leadership. Since 2008, HERproject has worked in more than 750 workplaces across 14 countries and has increased the economic potential of more than 850,000 women. Amplifying storytelling on social media: Brands are increasingly using social media to crowdsource content and spur audience engagement, especially around social issues. WOW air is celebrating IWD by honoring inspirational women via the #wowwoman social media campaign, which encouraged U.S. residents to share stories of important women in their lives on Facebook and Instagram between February 26 and March 7. Today, WOW air will repost the most inspirational stories and award the winner two tickets to a destination of her choice within its network. Pledging donations still has big impact: As companies move toward broader gender equality initiatives, pledging donations based on the sale of branded items is still a tried-and-true way to make a positive impact. 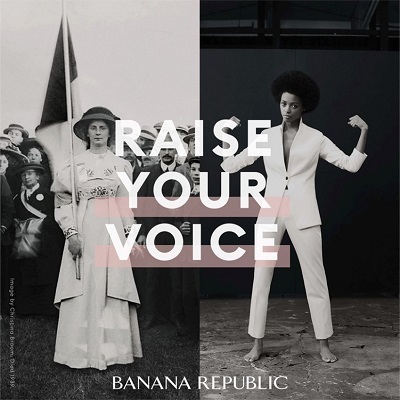 In honor of IWD, Banana Republic launched its first Equality Collection capsule. A portion of proceeds will support the work of CARE, a nonprofit focused on fighting poverty and the advancement of women and girls around the world. Equality Collection pieces incorporate messages of empowerment, and a donation of $5 from the sale of each item (up to a maximum of $80,000) will be made to CARE until April 25. Addressing gender equality is important now more than ever, and global movements like #MeToo and #TimesUp are proof of that urgency. In fact, consumers see companies as critical changemakers – 80 percent believe companies should have a seat at the table to address women’s rights. And companies are heeding the call – using core competencies and assets in a range of ways to make an impact, from capsule collections to cross-industry partnerships.